APA is a documentation system developed by the American Psychological Association that has, generally, been adopted by the scientific community for the purpose of publishing scientific findings by experts in their fields. Unfortunately, APA does not work very well with literary studies, for reasons that will become clear later. If you go to the U.S. to do graduate work in literary studies, you will most likely be asked to use the Modern Language Association (MLA) documentation style, which is geared more toward the literary arts. I just want you to be aware of this, so that when you go to that first U.S. university graduate class, you will be prepared to make the shift into MLA, which is not difficult, but significantly different from APA. For those of you doing pedagogical or translation studies, APA may be totally appropriate, but it will depend on the policy at your U.S. school and department. For now, you may have to tweak APA to fit literary analysis protocols, explained in some more detail later. 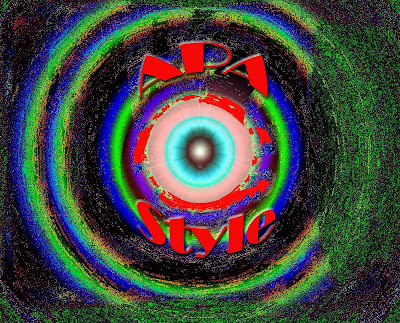 APA is primarily a scientific documentation system, which refers to its authors by last name, which seems to work well in the scientific community. However, in literary studies, this practice can be problematic in that full names of poets and writers are important and should not be truncated. For example, Charlotte Perkins Gilman would never be referred to as "Gilman" in text, except maybe as a second and subsequent reference. When discussing literature itself, one should use the "historical present," which, technically, is incorrect in APA, where the past tense is used to discuss scientific findings. For literary studies, the second option is awkward, and does not reflect how literary scholars discuss literature. In APA, it is assumed that a juried article would be written by an expert in the field, so mentioning his or her last name in text would most likely be a given. However, when one uses a "popular" source, such as a periodical, newspaper, or website, the authority of the author might be secondary to the publication itself. Journalists, writers who are considered "generalists" (Jacks-of-all-trades), fall into this category. Therefore, it might be more appropriate to mention (in the signal phrase) the title of the publication instead of the author of the article. In popular culture papers, the first example makes more sense. The author/journalist (unless he or she is a superstar journalist specializing in field he/she is writing about) is given authority by the publication for which he or she works, not on his or her own name, so mentioning the publication in the signal phrase would be more appropriate. APA papers are double spaced. Click on image for a larger view. 1. According to Kate Chopin (2009), Mrs. Mallard has died “of the joy that kills” (para. 23). Explanation: Although the story was originally published in 1894 (publication venue unknown) and 1897 (in A Vocation and A Voice, a story collection), one should refer to the actual site where the story was found. And "The Story of an Hour" was posted on this website in 2009, which references the original publication dates. 2. USA Today has warned that air travel for the 2009 Christmas season could prove to be vexing, with higher fees, fewer flights, long lines at the ticket counter, and crowded airplanes: “If you haven’t flown in awhile and plan to take to the skies, brace yourself” (Jones, 2009, p. 1a). Explanation: The authority here is USA Today, not author Jones, so the title of the publication is part of the signal phrase. 3. Frieda Hughes (2007) has revealed that her late mother Sylvia Plath left behind a manuscript of 40 poems, which was later published as the Ariel collection but in a different arrangement as selected by the late poet’s husband Ted Hughes. Ariel: The Restored Edition has restored, in facsimile, the Ariel collection, which “exactly follows the arrangement of her last manuscript as [Plath] left it” (p. ix). Explanation: I used Frieda Hughes' first and last name because she is widely known as being the daughter of Sylvia Plath. To use just her last name might be confusing; readers might think that the name in the signal refers to Ted Hughes, the late husband of Sylvia Plath, and a poet in his own right. 4. In the movie Their Eyes Were Watching God, Director Darnell Martin (2005) uses an orange color cast to the film to depict the crushing heat of a Florida summer. Explanation: Again, I used first and last name and included his title. Although this information is in the reference list, including his full name and title allows the text to flow better and also helps the reader to understand the context with a minimum number of words. 5. In “Cut,” the poet Sylvia Plath (2007), has described the aftermath of slicing one’s thumb with a knife: “What a thrill—/My thumb instead of an onion./The top quite gone/Except for a sort of hinge/” (p. 25). Explanation: As a poet, Sylvia Plath is just too important to be reduced to just her last name. 6. 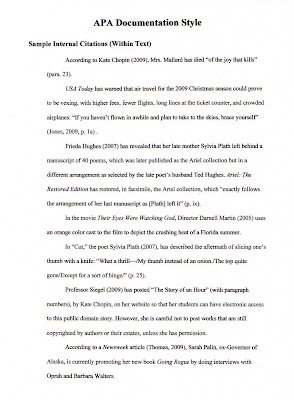 Professor Siegel (2009) has posted “The Story of an Hour” (with paragraph numbers), by Kate Chopin, on her website so that her students can have electronic access to this public domain story. However, she is careful not to post works that are still copyrighted by authors or their estates, unless she has permission. Explanation: I'm not a famous person, so including my full name would be irrelevant here. However, my title affords me some authority to post educational materials online. 7. According to a Newsweek article (Thomas, 2009), Sarah Palin, ex-Governor of Alaska, is currently promoting her new book Going Rogue by doing interviews with Oprah and Barbara Walters. 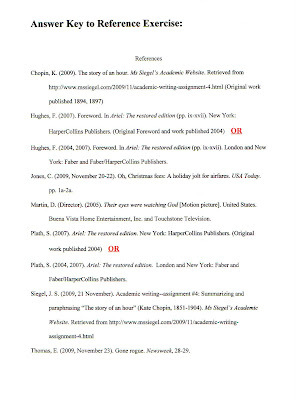 APA Reference lists are double spaced. Click on image for a larger view. 2b. Hughes, F. (2004, 2007). Foreword. In Ariel: The restored edition (pp. ix-xvii). London and New York: Faber and Faber/HarperCollins Publishers. Explanation: Although I lean toward accepting the first example, one could make a case for the second as well. When looking on the publication page, one sees publication data for both companies. Moreover, the printer and binder for both editions is located in Chatham (UK). In class, we discussed that because Ariel was originally published in 1965, we should, at the end, include (Original work published 1965). However, after re-examining the book, I have concluded that this restored edition is significantly different from the original, in that this edition contains a facsimile of Plath's original manuscripts. In addition, the arrangement of poems has also been changed. One could add (Original work published, in a different format, 1965). However, I chose not to do this because some poems that appeared in the original were pulled from and added to this edition. 3. Jones, C. (2009, November 20-22). Oh, Christmas fees: A holiday jolt for airfares. USA Today. pp. 1a-2a. Explanation: Although APA asks that a volume number be included, I could not find this in the newspaper. 4. Martin, D. (Director). (2005). Their eyes were watching God [Motion picture]. United States. Buena Vista Home Entertainment, Inc. and Touchstone Television. 5b. Plath, S. (2004, 2007). Ariel: The restored edition. London and New York: Faber and Faber/HarperCollins Publishers. Explanation: (Kate Chopin, 1851-1904) is part of the title, not a publication date. 7. Thomas, E. (2009, November 23). Gone rogue. Newsweek, 28-29. Explanation: Although APA asks that a volume number be included, I could not find this in the magazine.